Experience quality Mercedes-Benz shocks repair and service in Plano, Richardson, McKinney, Frisco, and Allen, Texas at Linear Automotive. We can have our ASE certified technicians inspect your shocks and suspension system for any problems. We’re only minutes away so come visit us for Mercedes service in Plano and find out why people all over North Texas are choosing to do business with Linear Automotive. 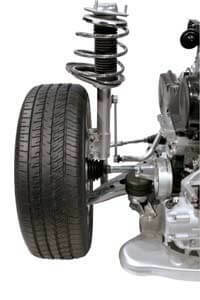 We can provide replacement of the shocks and struts that may be causing your rough ride symptoms. The first auto manufacturer that invented, patented, manufactured and installed the mono-tube shock absorbers on their new vehicles was the Mercedes in 1958. The design of the shock absorber is such that the tube cylinder has a free piston in the mono-tube shock absorber. On one side of this piston is a high pressure gas such as nitrogen and on the other side of the piston is the oil chamber. When the piston valve restricts the flow and is extended or compressed it has a dampening effect in either direction providing a smooth ride over rough terrain. The purpose of the shock absorbers is to not only provide a smooth ride for the passengers, but to provide a quality handling of the vehicle. The original design was to prevent spring oscillations. The shocks are considered a critical safety feature because without proper function it can become a safety hazard. Lack of functioning shock absorbers may cause the vehicle to bounce wildly, nose diving when stopping called deceleration squat, and have a poor cornering feeling as if out of control on two wheels. Shock absorbers last about 50K miles and then need to be replaced. 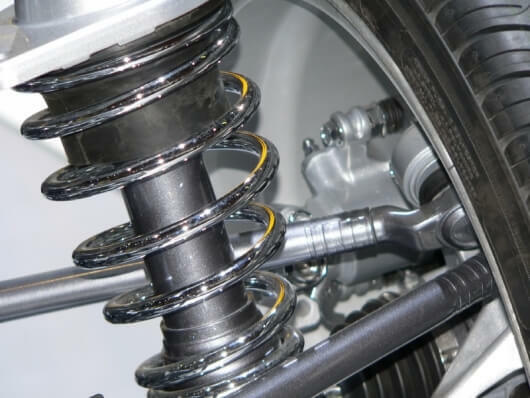 When checking the shock absorbers there are tell tale signs that indicate they need replacement. Oil on the outside of the shaft indicates that the cylinder is leaking oil from the oil chamber, which provides the rebound of the shock, so it needs replacing. Other visual shock failure signs are worn, broken, or corroded mounts on the shock ends should also be replaced. If the shock bushings are worn the shock mount will not be stable or if there is more than enough corrosion on the shocks to degrade its function it also needs replacement. 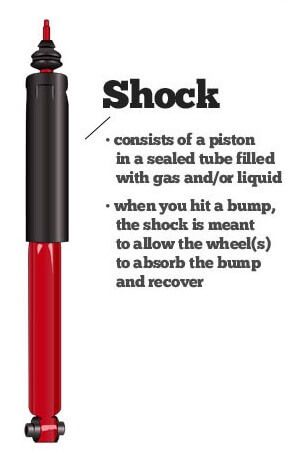 A common test for shock absorbers is to bounce the corner of the vehicle and then release. If the auto continues to bounce more than three times the shocks are considered weak and should be replaced. 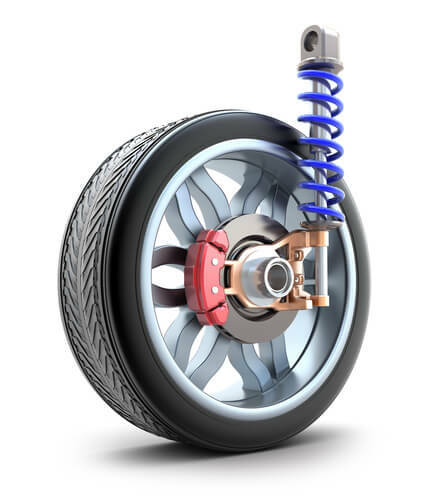 Springs give the structural support to the vehicle and with shocks not performing stability or the dampening effect of the spring movement, they need replacement. The piston rod on top is the working cylinder and attached to the frame at the top end while the inner tube is attached to the suspension base. The bearing at the top tube keeps the piston rod in alignment as it moves by the extension and contraction. There must be resistance in the extension and contraction through the valve restriction on the inside. When extended it allows oil or fluids to move through the restricted valves into the second chamber and the opposite occurs when there is contraction. When there are extreme road conditions the movement of the shock absorbers is so great that it creates heat to the point the air in the oil accumulates into foam and the shock absorber is called shock absorber fade. Shock absorbers can come filled with oil, or oil and nitrogen, or all nitrogen filled shock absorbers. Another type of shock absorber is the air ride using air bellows, air bags or even air springs. These are an electronic shock absorber. They provide self leveling with an air compressor with an electric air auto-fill. The components include air lines, an air compressor, rubber seals and the electric motor. It does need occasional maintenance as they get older. This is an incredibly smooth ride like gliding on air. Linear Automotive can provide quality examination of your shock absorbers and complete suspension system to determine the problem by our certified professionals. We use OEM parts replacement in all our repairs. If your Mercedes needs new shocks give Linear Automotive a call and we will be glad to schedule an appointment. Our certified mechanics help people who need Mercedes Shock Absorbers in Plano, Richardson, Allen, McKinney, Frisco, The Colony, and all surrounding areas in North Texas.